This page mainly describes a clinical syndrome caused by irritibility of the vestibular nerve. The main clinical feature is repeated brief spells of vertigo, variably accompanied by other signs of damage to the 8th nerve. The best name for this syndrome is probably "vestibular paroxysmia". There are several processes that have been suggested by ourselves and others to cause "vestibular paroxysmia"
Nerve damage from surgery on the 8th nerve. 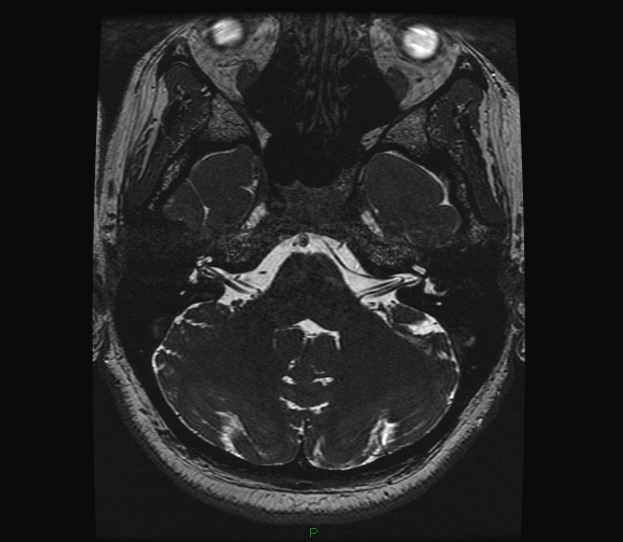 Microvacular compression due to left intra-IAC loop with vestibular paroxysmia (image due to Dr. Dario Yacovino). The most well known of these is microvascular compression.In microvascular compression syndrome (MVC), vertigo and motion intolerance is attributed to irritation of the vestibular portion of the 8th cranial nerve by a blood vessel. It is a controversial syndrome at present, but in the author's opinion, there is some validity to it. The characteristic symptom of nerve irritation is quite common in clinical practice, and it does usually respond to medication. The controversial part is the origin. If one accepts that these symptoms are always due to blood vessels, than a surgical approach is worth considering. On the other hand, if these symptoms are generally due to other processes, then medical management should be preferred. It is the opinion of the author of this page, that the latter is the case. The existence of MVC was inferred by analogy to the syndrome of hemifacial spasm, in which it is well accepted that the usual cause is a aberrant blood vessel. Dr. Peter Jannetta, a neurosurgeon in Pittsburgh Pennsylvania, together with Drs Aage Moller and Margarita Moller, pioneered the diagnosis and treatment of this condition. Although hemifacial spasm is now presently well accepted to be related to vascular compression, the numerous other syndromes proposed by Janetta and associates to be related to vascular compression (e.g. trigeminal neuralgia, glossopharyngeal neuralgia, and even essential hypertension) are not as well accepted as being a consequence of vascular compression. In 1984, Janetta, MB Moller and AR Moller described "Disabling positional vertigo", characterized by a history of vertigo, a small midfrequency notch on audiometry, acoustic reflex abnormalities, and an increased I-III latency with brainstem audio-evoked responses using a "tone burst" stimulus. The "positional vertigo" designation appears to be a misnomer as subsequent authors have not emphasized this finding. Some have indicated that motion intolerance may include repositioning. Jannetta and associates proposed treatment by placing an absorbable sponge between the nerve and the blood vessel. While this treatment is intended to buffer the nerve from the blood vessel, later writers have questioned whether this procedure actually simply damages the 8th nerve, or that it is actually a sham procedure (Schalber and Hall, 1992). Others have suggested that the appropriate treatment is vestibular nerve section (McCabe and Harker, 1983). In spite of numerous papers being published on this condition, the very existence of MVC continues to be questioned. The symptoms of MVC are all nonspecific ones, that could easily be found in other conditions such as Meniere's disease, Migraine or simply a constitutional motion intolerance. No specific convincing test abnormality has yet been demonstrated. The ABR findings reported by Moller to be characteristic of MVC would not be considered abnormal by most clinicians (Schwaber and Hall, 1992). No findings related to blood vessels (e.g. air CT, MRA, etc.) will ever be diagnostic as blood vessels cross the 8th nerve of at least a third of normal individuals (Parnes, 1990). A specific type of tinnitus called "typewriter tinnitus" has been suggested to be due to microvascular compression of the cochlear nerve (Levine, 2006). See here for more detail. Quick Spins -- other causes. In essence then, MVC is a syndrome of vestibular (quick spins, possibly combined with motion intolerance) or positional auditory symptoms that respond to treatment with medications for neuralgia (e.g. carbamazepine or oxcarbamazine), and in which other reasonable causes (i.e. Meniere's disease, Migraine, labyrinthitis, fistula) have been excluded. Logically, there is nothing about this constellation of symptoms that requires a vascular origin. The key features of the syndrome boil down to what should describe an electrical problem - -very brief and strong symptoms, that respond to neuralgia medications. Anything that irritates the vestibular nerve or central vestibular pathways, should cause similar symptoms, and the literature says that it does (e.g. Moon and Hain, 2005). Thus a more reasonable name for this syndrome is vestibular paroxysmia. See the above table for a list of possible causes. "Quick spins" and acquired motion intolerance may be characteristic clinical symptoms, although at the present writing, studies looking for subpopulations with those particular index symptoms for response to decompression surgery have not been made (and probably they will never be done). In our opinion, air contrast CT or MRI/MRA are not diagnostic if a blood vessel is seen, it need not be viewed with concern, but MRI/MRA may help in excluding alternative causes. Newer types of MRI including FT-FISS may be more helpful . McDermott and associates, in a large study, recently reported that loops that extend into the IAC (internal acoustic canal) are more significant sources of unilateral auditory symptoms (such as tinnitus) than loops simply within the CPA (cerebellopontine angle). (McDermott et al, 2003). A simple severity classification system from McDermott et al (2003) is as follows: type I -- in the CPA but not entering the IAC, type II, entering the IAC but extending less than 50% of the length of the IAC, and type III, extending more than 50% of the length of the IAC. Gultekin and associates reported no correlation (2008). CISS MRI was reported "positive" in 95% of the patients reported by Huffner et al (2008). As there are blood vessels in everyone's IAC , and there are certainly many other potential causes of vestibular nerve irritibility, in our opinion, this finding is difficult to interpret. ABR, if abnormal on the side of auditory symptoms supports the diagnosis, but a normal ABR does not exclude it. Quality control on ABR testing is terrible, and norms are often unavailable even in textbooks as they are device specific. Furthermore, ABR peak assignment is generally very haphazard and without any consideration of noise. For this reason we do not generally recommend using ABR for diagnosis of MVC. In essence, this syndrome cannot be definitively diagnosed until a surgical exploration has been done and the patient is cured on follow-up. Our feeling, however, is that this is an unreasonably agressive approach to diagnosis, and that the combination of the studies below and hyperventilation induced nystagmus that reverses the spontaneous nystagmus is sufficient to diagnose. A recent uncontrolled study of Hufner et al (2008) is heavily quoted below. Because this study was uncontrolled, one should be cautious in interpreting these numbers as we don't know how many people "on the street" might have exactly the same findings. In our practice, our "basic" tests are MRI, EEG and Audiometry. We add on others depending on our clinical suspicion. The MRI is probably the most important of the three. Here the goal is not so much to see the blood vessels, but rather to exclude structural lesions of the brain such as tumors. The EEG is of less importance as it rarely affects treatment. Audiometry is helpful in distinguishing between seizures and inner ear processes. On physical examination, the combination of finding a spontaneous nystagmus that reverses on hyperventilation is (in our opinion anyway), highly suggestive of vestibular paroxysmia and response to treatment (see below). This observation has recently been corroberated by Huffner et al (2008). Similar nystagmus is seen in patients with purposeful lesions of the 8th nerve, such as gamma knife surgery of acoustic neuroma, as well as in acoustic neuromas themselves. The way that I test for hyperventilation induced nystagmus in my dizzy clinic. 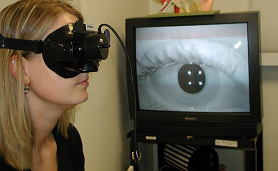 There is also a MOVIE: hvt small.avi (15 meg) Hyperventilation induced nystagmus in person with an irritible vestibular nerve due to a left sided acoustic neuroma. This is a rather long (1.5 minute) clip. eslicarbazepine (Aptiom) 400 Probably fewer side effects, expensive as branded, unknown efficacy but probably identical to oxcarbazepine. It is the author's view that a trial of treatment with oxcarbamazine (an anticonvulsant that is a sodium channel blocker) is usually indicated for the index symptom of "quick spins". This was also the suggestion of Hufner et al (2008). Addition of baclofen may be reasonable if there is a partial response. Other treatments of neuralgia, such as other anticonvulsants (carbamazepine) may also be considered. We have had some success with Keppra. (levetiracetam). A new medication called "eslicarbazepine", was FDA approved on Nov 8, 2013. It is suggested to cause less side effects than either oxcarbazepine or carbamazepine. As Oxcarbazepine has side effects only on very rare occasions, while we like the idea of safer drugs, right now the cost-benefit ratio is strongly in favor of oxcarbazepine. All of the drugs related to carbamazepine have low sodium as a common side effect. While it was first thought that this hyponatremia was due to too high ADH, as ADH levels are normal, it is now thought that this is due to increased sensitivity to ADH. It is rare that hyponatremia associated with oxcarbazepine results in clinical symptoms. While there are many alternative medications for neuralgia, there is little motivation to explore them as oxcarbamazine is generally very effective and safe. We advise extreme caution. Logically, only treatments that affect the nerve proximal to the site of irritation seem likely to work. In other words, transtympanic gentamicin treatment and a simple labyrinthectomy seem unlikely to be effective. Vestibular nerve section seems overly aggressive in as much as the diagnosis is so difficult and the disability of nerve section is relatively high. Sporadic reports continue to be published concerning good results of decompression surgery, (e.g. Bernard-Demanze et al , 2015; Borghei-Razavi et al, 2014; Zhang et al, 2012). These in our opinion carry little weight due to the bias that exists for publishing good results. Yap et al (2008), after reviewing all published studies on MVC, noted that "No standardised outcome measures were used and all studies rely on patient subjective assessment of surgical outcome. " The decompression surgery (e.g. Brackmann et al, 2001 as well as multiple authors in the table above) is risky as it involves a neurosurgical approach to the brainstem area. Because the diagnostic criteria at the moment require response to medication, surgery seems reasonable only as a last resort in individuals who develop medication intolerance, and in whom all other reasonable alternatives have been excluded. Bernard-Demanze, L., et al. (2015). "Effects of microvascular decompression surgery on posture control: A case report in an elderly patient." Neurophysiol Clin 45(3): 191-201. Borghei-Razavi, H., et al. (2014). "Disabling vertigo and tinnitus caused by intrameatal compression of the anterior inferior cerebellar artery on the vestibulocochlear nerve: a case report, surgical considerations, and review of the literature." J Neurol Surg Rep 75(1): e47-51. Levine, R. A. (2006). "Typewriter tinnitus: a carbamazepine-responsive syndrome related to auditory nerve vascular compression." ORL J Otorhinolaryngol Relat Spec 68(1): 43-6; discussion 46-7. Moller, M. B., et al. (1986). "Diagnosis and surgical treatment of disabling positional vertigo." Journal of Neurosurgery 64(1): 21-28. Moller, M. B. (1990). "Results of microvascular decompression of the eighth nerve as treatment for disabling positional vertigo." Annals of Otology, Rhinology & Laryngology 99(9 Pt 1): 724-729. Moller, M. B. (1997). "Selection criteria and treatment of patients with disabling positional vertigo." Stereotactic & Functional Neurosurgery 68(1-4 Pt 1): 270-273. Schwaber, M. K. and J. W. Hall (1992). "Cochleovestibular nerve compression syndrome. I. Clinical features and audiovestibular findings." Laryngoscope 102(9): 1020-9. Schwaber, M. K. and W. O. Whetsell (1992). "Cochleovestibular nerve compression syndrome. II. Vestibular nerve histopathology and theory of pathophysiology." Laryngoscope 102(9): 1030-6. Yap, L., et al. (2008). "Microvascular decompression of cochleovestibular nerve." Eur Arch Otorhinolaryngol 265(8): 861-869. Zhang, L., et al. (2012). "Microvascular decompression of cochleovestibular nerve in patients with tinnitus and vertigo." Neurol India 60(5): 495-497.